Osmosis: Herpes medications. (2019, April 20). 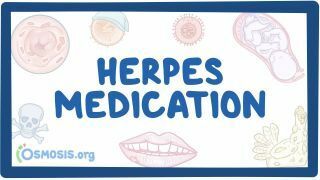 Retrieved from (https://www.osmosis.org/learn/Herpes_medications). Aciclovir, also known as acyclovir and acycloguanosine, is an antiviral medication. It is primarily used for the treatment of herpes simplex virus infections, chickenpox, and shingles. Other uses include prevention of cytomegalovirus infections following transplant and infections due to Epstein-Barr virus. It is available by mouth and intravenously. Aciclovir is converted by viral thymidine kinase to aciclovir monophosphate, which is then converted by host cell kinases to aciclovir triphosphate (ACV-TP). ACV-TP, in turn, competitively inhibits and inactivates HSV-specified DNA polymerases preventing further viral DNA synthesis without affecting the normal cellular processes. Ganciclovir (alternative spelling: Gancyclovir, trade names: Cytovene and, for ocular use, Vitrasert) is an antiviral medication used to treat cytomegalovirus (CMV) infections. Ganciclovir triphosphate is a competitive inhibitor of deoxyguanosine triphosphate (dGTP) incorporation into DNA and preferentially inhibits viral DNA polymerases more than cellular DNA polymerases. In addition, ganciclovir triphosphate serves as a poor substrate for chain elongation, thereby disrupting viral DNA synthesis by a second route. Valaciclovir is an antiviral drug used in the management of herpes simplex, herpes zoster (shingles), and herpes B. It is a prodrug, being converted in vivo to aciclovir. Famciclovir (trade name Famvir) is a guanosine analogue antiviral drug used for the treatment of various herpesvirus infections, most commonly for herpes zoster (shingles). It is a prodrug form of penciclovir with improved oral bioavailability. Which viral enzyme is responsible for activating Acyclovir?